Nutek Europe is the European distributor of Nutek Board Handling & Traceability Equipment, and is the leading supplier of automated board handling equipment for the European, African and Middle East PCB Assembly industry. Our history traces back to 1992, when Nutek Europe BV obtained the exclusive European sales rights of Nutek Pte Ltd, Singapore. Since then a network of agents has been setup to serve customers throughout our sales region. The agents are supported by the Nutek Europe’s area sales managers who are familiar with the entire production process and specialize in several specific areas. Nutek Europe has its own customer-service department with a standard 12-hours response time. Naturally, Nutek Europe has the necessary spare parts on stock for fast delivery, if required. 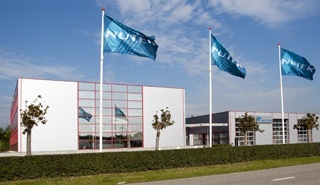 The Nutek Europe facility offers adequate space for customer demonstration’s, technical and sales training and has a 750 square meter warehouse, where the European stock of Nutek equipment, including spare parts and magazine racks is stored. For the visitors of our website who are not familiar with our industry we have created a page explaining what boardhandling and traceability equipment is. To view this page >> click here.